These gathering blocks made with a hickory base. Includes a slated shelf for extra storage underneath. Pull out drawer is large enough for a full size butcher knife and is on self retracting ball bearing glides. The tops are made 5" thick end grain hickory and are 24" wide 36" long. 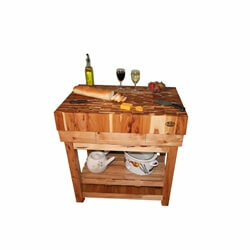 These butcher block tops are end grain with a food safe finish cut chop and prepare food on top of this hickory block. Hickory is one of the hardest woods that grows in North America.